Hawksmoor Fund Managers was delighted to win Boutique Management Group of the Year (Multiple Strategies) at the Investment Week Specialist Investment Awards 2017. 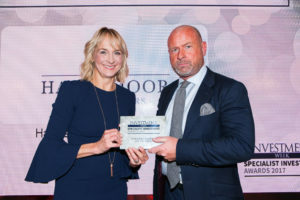 Paul Jordan was at the awards ceremony at Plaisterers’ Hall in London to accept the award from BBC Breakfast presenter Louise Minchin. All award winners were selected using a combination of quantitative and qualitative criteria, as well as independent performance data from Morningstar, FE Trustnet and Lipper, and additional analysis was conducted by a judging panel of leading fund analysts and researchers.